But what exactly does this mean for people living in Boston and the surrounding areas? Well, what’s novel and important about the research is that we can actually take a closer look at projections for different states and cities. For Boston, a 12-inch increase in sea level rise (above normal high tide levels) is projected by 2050, although this will vary depending on how pessimistic the emissions scenario and the exact location. You can see precisely what a 1-foot rise in sea level would mean for Boston by clicking on their interactive map which depicts projected sea level rise, here. But just how vulnerable will we be, given a rise of approximately 1 foot, relative to other local states? 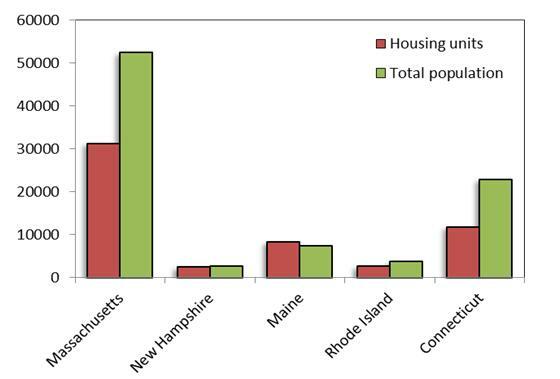 This figure compares total land area, population size and number of housing units below 1m (3.3 feet) between the 6 States in New England. What’s immediately apparent is that MA has the largest population and number of housing units found less than 1m above local high tide levels than any of the other States in New England. Relatively speaking then, Boston and surrounding areas are likely to be the hardest hit. To many of us, a rise in 1-foot may not sound or look particularly drastic. Especially, you may be thinking, if the rise in water level was relatively progressive. If it were progressive, any negative impacts such as property damage, could be mitigated or controlled. Unfortunately, simply increasing sea levels is not the end of the story. The report also forecasts a greater likelihood of flooding caused by storm surges, in other words, more extreme weather events like those that have already hit other areas of the US. For the Boston Harbor area, the research has demonstrated that the likelihood of severe floods (between 4-5 feet above current high tide levels) will increase by 23% by 2030, and in fact, the likelihood of severe floods has already doubled relative to historic frequencies. We are already in the grip of climate change-induced flooding, and this is only going to get worse over time. Clearly, increasing chances of flooding will result in significant property damage along the coast. In Boston, 600 homes and just over 11,000 people live less than 4 feet above high tide. Real estate values alone for these homes is in the hundreds of millions of dollars. Insurance premiums will increase, and who knows how insurance companies will likely adjust their flood policies in response to climate change. Public and private infrastructure in these zones – roads, subways, buildings, etc. — represents trillions of dollars of additional investment at risk. So what can we, individually and collectively, do to ameliorate this situation? First of all, we can take action to reduce CO2 emissions personally. Consider energy saving measures within your own household; recycle, ride a bike to work or take any measures to reduce your carbon footprint by calculating it here. You can also join a web-based carbon reduction team on carbonrally.com, or a neighborhood based team through BostonCAN. Furthermore, if you live less than 4 feet above the high tide level, it’s time to seriously consider getting flood insurance. Taking personal steps to conserve energy is a necessary piece of the puzzle, but our real power lies in getting organized. It’s going to take strong grassroots pressure to get our government officials and business leaders to take the big steps that will make the large-scale changes we desperately need. To multiply the effect of personal action, join local organizations such as Boston Climate Action Network and get involved. If we all band together, it may not be too late for us to weather this storm. Boston residents currently have a great opportunity to influence the City’s planning for mitigating and adapting to climate impacts. The City of Boston has engaged the Metropolitan Area Planning Council (MAPC) to update the City’s Hazard Mitigation Plan. The Boston Hazard Mitigation Plan presents a strategy for reducing the City’s vulnerability to the impacts of natural hazard events such as flooding and hurricanes. Find out how you can get involved in the Hazards Mitigation planning process by calling 857-544-6846. Thanks to Marian Wong for this guest blog post. Previous Article Connect the Dots!